Tastes like a soave, made by Joe Grilli of Primo Estate. A very enjoyable quaffing dry white; light bodied, nicely balanced and adaptable with food. Straw and spice aromas, fairly simple with fresh acidity and a properly dry finish. Drink over the next two or three years; 12 percent alcohol. 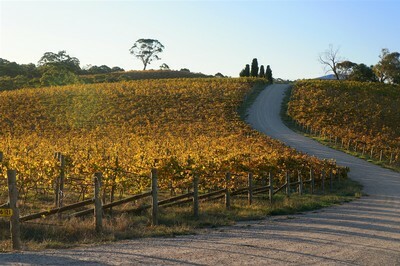 The 2008 JOSEPH Moda has made The Australian Wine Journal's Top Dozen for 2010/11. Up and coming wine blogger Chris Plummer has just released his inaugural Top Dozen wines. Chris selected the 2008 JOSEPH Moda in his best wines of the year alongside names like Cullen, Grosset, Wendouree and Tapanappa. Chris writes of the 2008 Moda: Like the Wendouree, Joseph's 2008 Moda was hardly born out of a wonderful year for McLaren Vale cabernet, but this time, I feel Joe Grilli's freakish winemaking abilities have helped carve out a magnificent wine every bit as much as the choice of his vineyard site and its management. In fact, McLaren Vale's suffered through a few less than perfect cabernet vintages lately, but Grilli's time proven ability to make deliciously rich, hedonistically smooth, ripe and dusty cabernet merlots using the Italian Amarone method of drying grapes on racks after harvest, has once again produced a stunning take on McLaren Vale cabernet. As with Wendouree's 2008 Cabernet Malbec, I don't actually feel the 2008 Moda is one of Jospeh's very best vintages, but it still serves as a benchmark as to what can be achieved in unbelievably hot, dry seasons. Sadly we sold out of the 2008 JOSEPH Moda earlier this year, however the current 2009 vintage is also looking superb! From Joe Grilli of Primo Estate, this is one of the more powerful Nebbiolos around. There's a lot of savoury, barrel derived effect (rather than overt oak), with vibrant berries and a dash of mint. Lashings of gripping tannin surround a rich, fruit-sweet core. Louise Radman featured our new Primo Secco NV in the July issue Adelaide Magazine. A fresh, fruitful blend of Colombard, Chardonnay and Sauvignon Blanc in the style of Italian Prosecco. Light bodied and aromatic with bubbly passionfruit personality, lemongrass tang and vivacious sparkle. Makes the perfect aperitivo, spritzer of Bellini cocktail. Match with goat curd, white anchovy, antipasto. The label on this young South Australian merlot advises that it's 'best enjoyed chilled on a hot day', It is true, a no-fuss, summer-weight red wine with earth blueberry and plummy aromas that have a slight bubblegum-like, whole bunch character. The palate is all about soft, suicy, spicy fruit character that finishes dry.